Ballet dancers should have hair neatly pulled back from the face and in a bun if possible. Male dancers have the option of black leggings, a white t-shirt, and black ballet shoes. 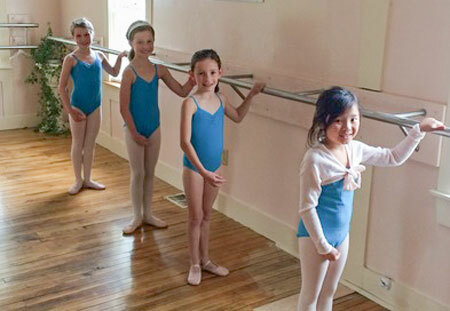 Girls should wear their assigned leotard color, pink footed or convertible tights and pink ballet slippers. Ballet attire or comfortable play clothes that are easy to move around in. Socks or indoor shoes please! Ballet or jazz attire, hair pulled back. Jazz Shoes or socks. Jazz attire, hair pulled back Jazz shoes or Hermes Sandals/Foot Undies please. Loose clothing and hair pulled back! Please do not wear street shoes in the dance studio. Indoor Sneakers please! Tip: You can use Acrobat Reader to type into the order form, save it, and email it back!